Constitutional Law Review publishes studies and reviews of judicial practice in the field of Romanian and comparative constitutional law. Aiming to supplement the lack of strictly specialized journals in legal literature in Romania, Constitutional Law Review opens its pages to national and foreign authors, from law universities and legal practitioners, in order to promote constitutional principles and values, the knowledge and dissemination of case law of constitutional courts, of the Court of Justice of the European Union and of the European Court of Human Rights, of other international bodies, European standards to guarantee fundamental rights and freedoms as promoted by the Venice Commission. II. Author/Authors of the article. Authors shall assume full responsibility in order to comply with copyright law. Acceptance of materials submitted for being published is tantamount to signing the editing agreement, whereby the authors shall exclusively assign to Constitutional Law Review the right of reproduction and dissemination of the material in hard copy and electronically. The materials submitted for being published should not have been published before. Such materials may not be subject to other publications offer unless the refusal of their publication by the Editorial Board of Constitutional Law Review has been communicated. Authors should also specify together with their surname and first name, the profession, the teaching or scientific title, the institution where they currently work, the postal and electronic mail (e-mail) and the telephone number at which they can be contacted. Paper title should include full title, name, professional or academic affiliation of authors and their full addresses. For articles with multiple authors, each of them shall be mentioned on separate lines and followed by the details of their workplace (University, Faculty and Department). The title shall be written in capital letters, Times New Roman 14, bold, centered, in Romanian, English and French. Each article shall be provided at the beginning with an abstract written in Romanian, English and French, which should not exceed 250 words, characters Times New Roman 12 font size, italic, justify, double-space under the author’s name. It should be mentioned 4-6 keywords or phrases that capture the essence of the work, written in Romanian, English and French, two lines under the abstract of the work, Times New Roman characters, 12 font size, italic, justify. The article should be written in Romanian and in English or French. Use only Word format (.doc). Text should be typed on pages that have the same left/right alignment, Times New Roman standard, being mandatory to use diacritics specific for the language of the article. The font size of the text shall be 12, spacing of 1.5 and 2 cm lateral margins. Paragraphs should be marked in the text by paragraph or greater spacing between lines. When using abbreviations, abbreviated word should firstly appear in full with its abbreviation in brackets. Materials should not exceed 15 pages. Footnotes shall be written with Times New Roman 10, justify and one line spacing distance. Footnotes shall be numbered continuously for the whole article and not by resuming numbering on each page. There will be mentioned the full name of the author or the authors of the cited references, followed by the title of the work (book, article), publishing house/review, city, year of publication/issue number, page/pages number. Names of publishing houses, as well as of books and reviews are written in full, not abbreviated. Title of books and articles are written cursive/italic. Names of journals should be written in quotation marks. When using articles, reports, official documents, which are available online, their citation shall comply with the rules above, with the note that ”document is available online at … ” and date of last access. For case-law, it shall be indicated the document’s name, number and date of delivery/issue, issuer (court), place of publication (Official Gazette, collection/bulletin of judicial practice etc.). 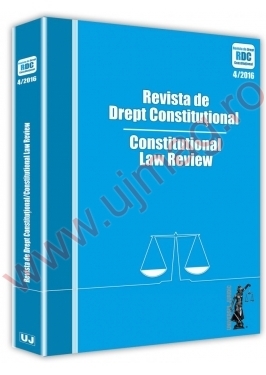 Authors should submit an electronic copy of the paper to the following e-mail address redactie@revistadedreptconstitutional.ro. All articles received for publication are subject to a review process in ”double blind” peer review system, in compliance with the international standards of scientific reviews. There are no fees for processing and publication of materials. Authors shall be informed about any recommendations and comments of reviewers in order to improve the quality of the article. Once submitted article has been accepted for publication, the author should submit its final version, including the comments of the reviewers who reviewed the article. Articles not accepted for publication shall not be refunded.